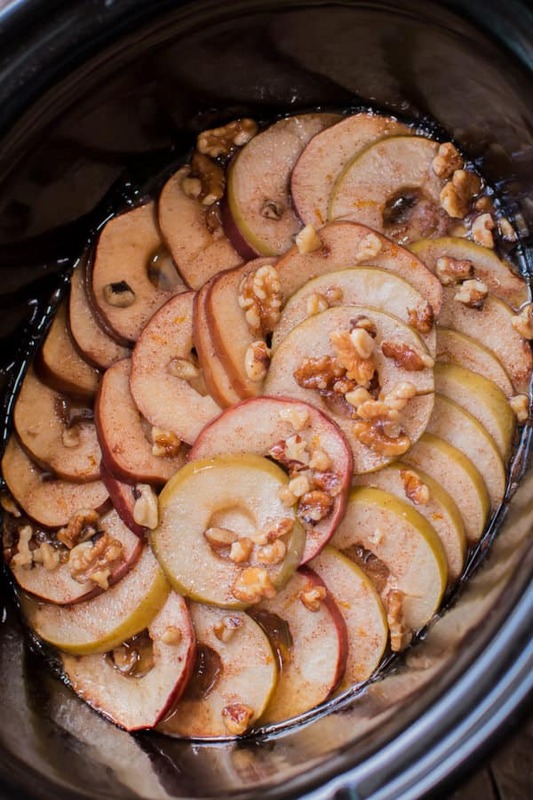 Slow Cooker Scalloped Apples have all the flavors of baked apples but in a pretty casserole form! 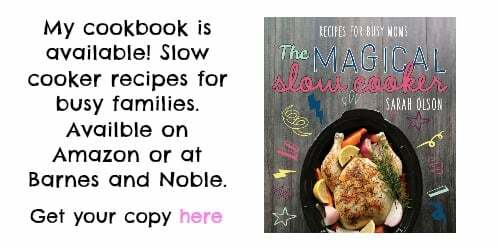 So good with ice cream and then drizzled with the sweet buttery sauce from the slow cooker. Hello! 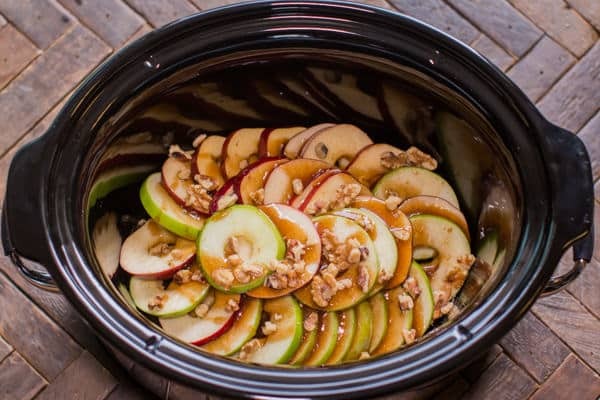 I think you will love these Slow Cooker Scalloped Apples. 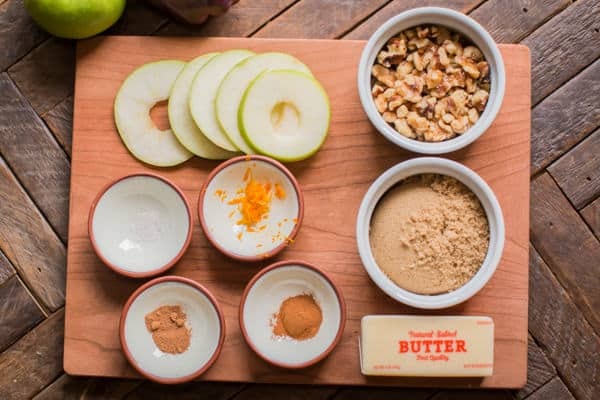 They taste just like baked apples but easier to eat and a little more flavor in each bite since the apples are thin sliced and seeped with the sugar and butter. 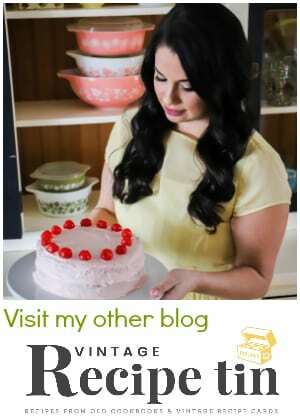 I planned to make this recipe for a while. I had the apples sitting on my counter, I knew exactly how I was going to make it. 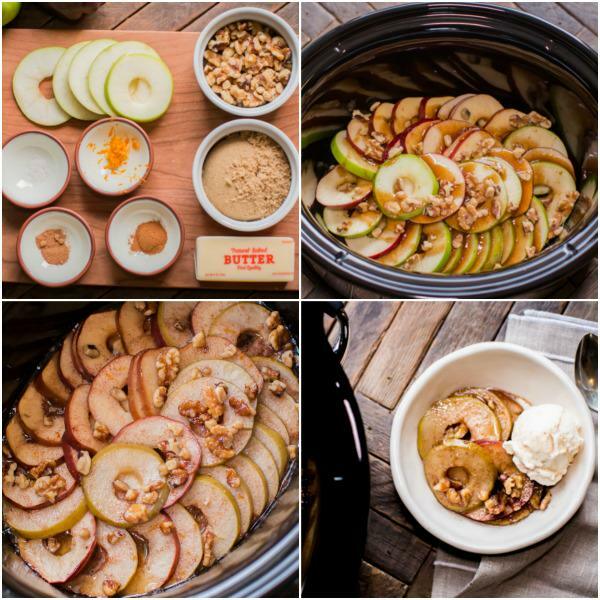 The sliced apples would have the stars in the middle and be so pretty spread out in the slow cooker. Then the day came to make it. What was I thinking? 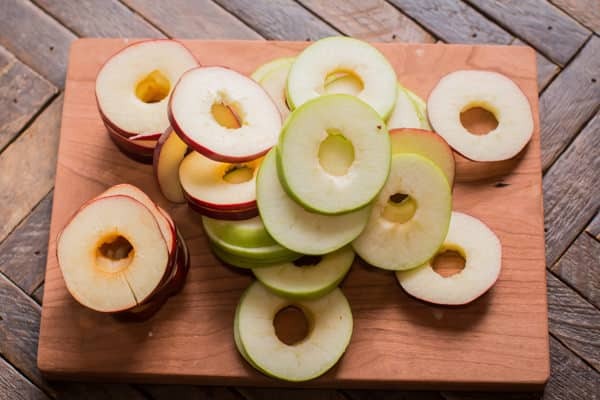 I could not leave the core in the apples?! That would not be tasty getting a bite of the seeds and the star part that surrounds them, because it’s similar to the shell of popcorn kernels and gets stuck in teeth while eating. Instead I cored the apples and I was happy to see that I still could make a pretty dessert. I do not have an apple corer, I have every other gadget in the world though. After slicing the apples I used a measuring teaspoon and punched out the centers of the apples with it, that worked great. I spread the apples out in a similar fashion as I would scalloped potatoes. I make a sauce on the stove-top in a small sauce pan. A stick of butter, brown sugar, cinnamon, nutmeg, orange zest and a touch of salt. Then I pour that over the apples. Then I sprinkle over walnuts. Below is what this looks like after cooking for 2.5 hours on high. 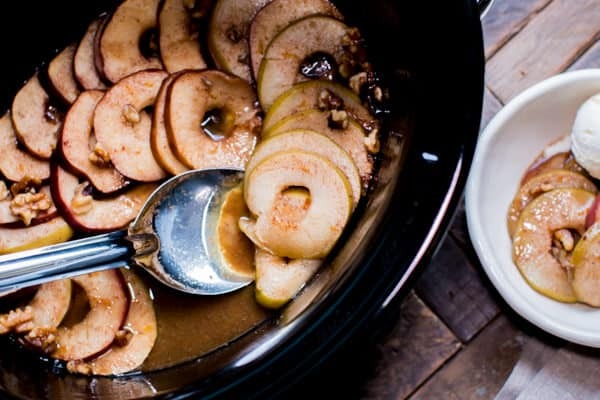 The apples and perfectly tender and the sauce is bubbly. I served this with ice cream and then drizzled the buttery sauce over the apples and ice cream. Here is my YouTube video on the making of this recipe. You can follow me on YouTube here for more videos like this. Doesn’t this look good? I know we are on the tail end of winter, but I think this recipe would be good anytime of the year. Have a great week! 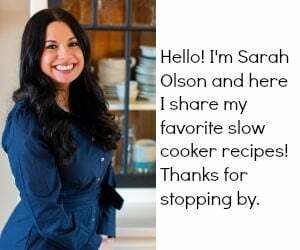 I’ll be back Friday with another new recipe. Slice and core the apples. I do not have an apple corer, I sliced the apples first then used a round measuring spoon to cut a circle out of the middle of each apple slice. 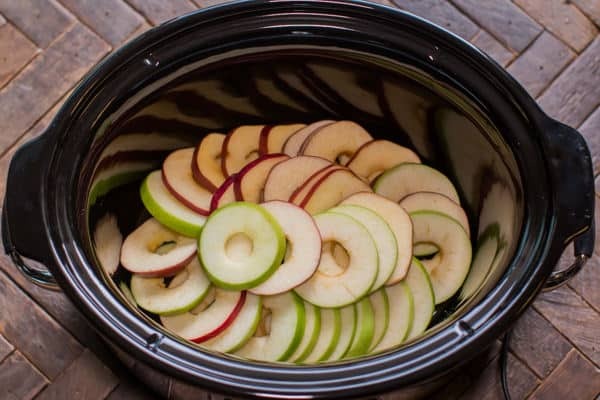 Arrange the apples in a circular design in the slow cooker. In a small pan over on the stove top set to medium high heat, melt the butter. Add the brown sugar, cinnamon, nutmeg, salt, and orange zest. Stir until a sauce forms for about 2 minutes. 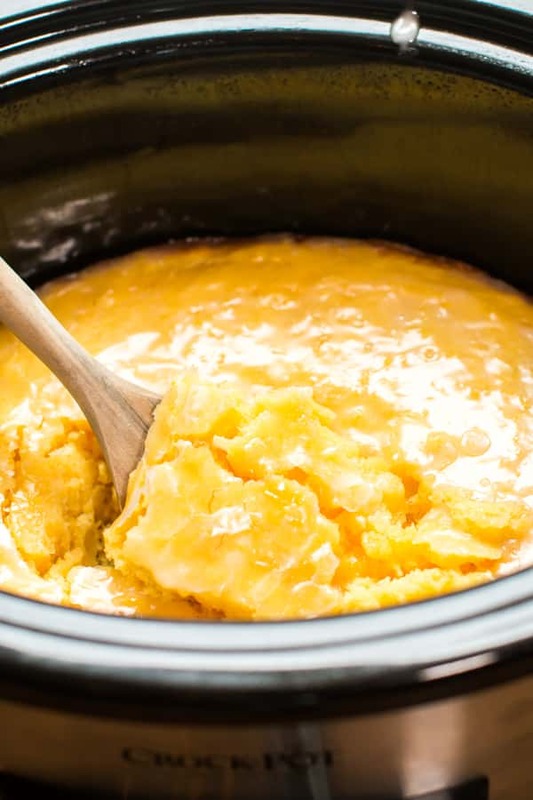 It's ok if the brown sugar doesn't completely dissolve, the slow cooker will finish that off. Pour the butter mixture over the apples evenly. 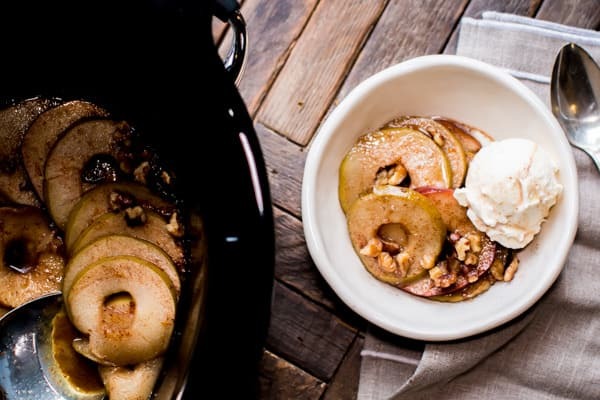 Serve warm with ice cream and drizzle the sweet buttery sauce over the apples and ice cream. 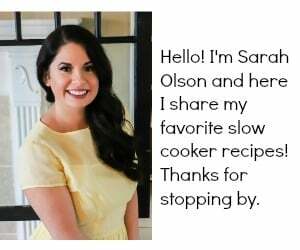 For this recipe I am using a 6.5 Quart Touch Screen Crock-Pot®. 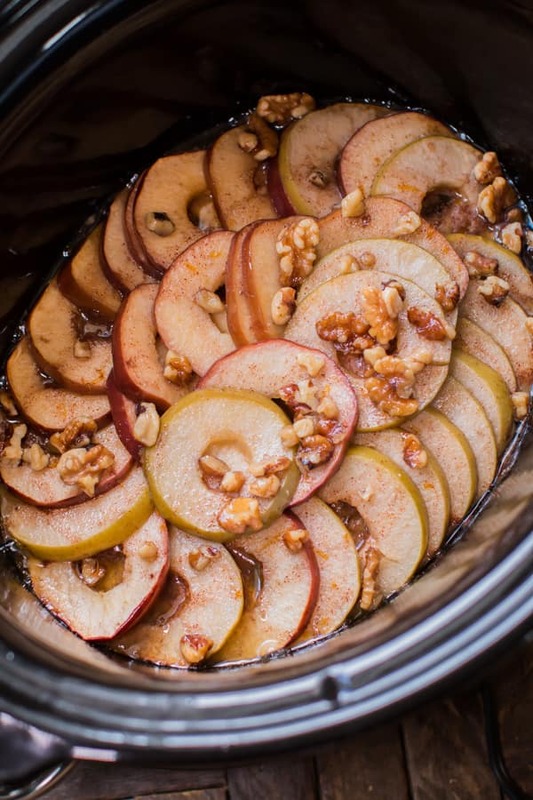 This recipe and video above was the first time I used this new slow cooker I bought. The screen is similar to a smart phone screen. So far I like this model, it cooks similar to my others. I am dieting……any suggestions for cutting back on the amount of butter? I would love to make this recipe. Hi Pamm. The only thing I can think to add is some apple juice, or cider to replace some of the butter. This looks and sounds great. Much like the baked apples my mom made for us when we were kids. 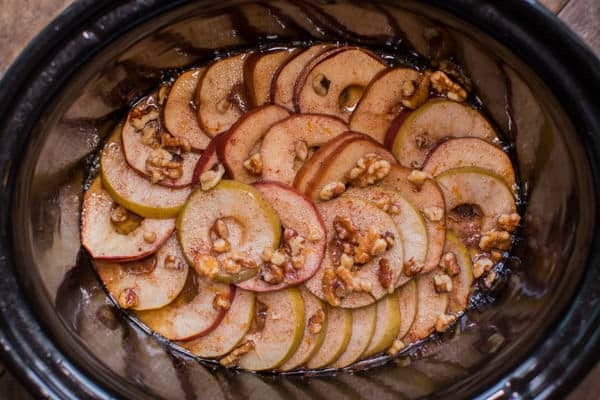 I’ve saved the recipe and will be making it as soon as I have apples. Could this be made in the oven? I am temporarily without a slow cooker. Oh my goodness, these look and sound amazing, yum! This sounds great. I have to give it a try soon. How about using coconut oil?